If using crescent rolls: Unroll dough; separate into 4 rectangles. Firmly press perforations to seal. Press each to form 6-inch square. If using dough sheet: Unroll dough; cut into 4 rectangles. Press each to form 6-inch square. Spread each square with mustard to within 1/4 inch of edges. Top with ham and cheese. Roll up. Press to seal ends and seams. Place rolls seam side down on ungreased cookie sheet. Bake 16 to 21 minutes or until golden brown. Meanwhile, melt butter in 8-inch skillet over medium heat. Add apple; cook about 2 minutes, stirring occasionally, until tender. Add brown sugar and cinnamon; mix well. Stir in jelly until melted. Cook about 2 minutes or until bubbly, stirring occasionally. 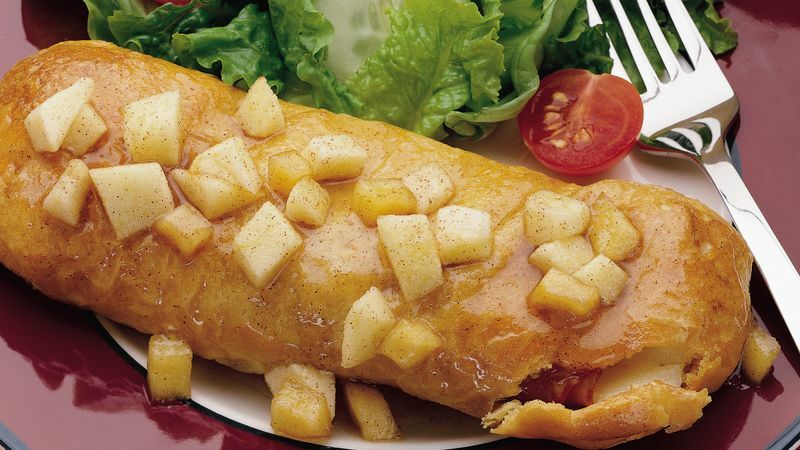 Serve apple mixture over roll-ups.